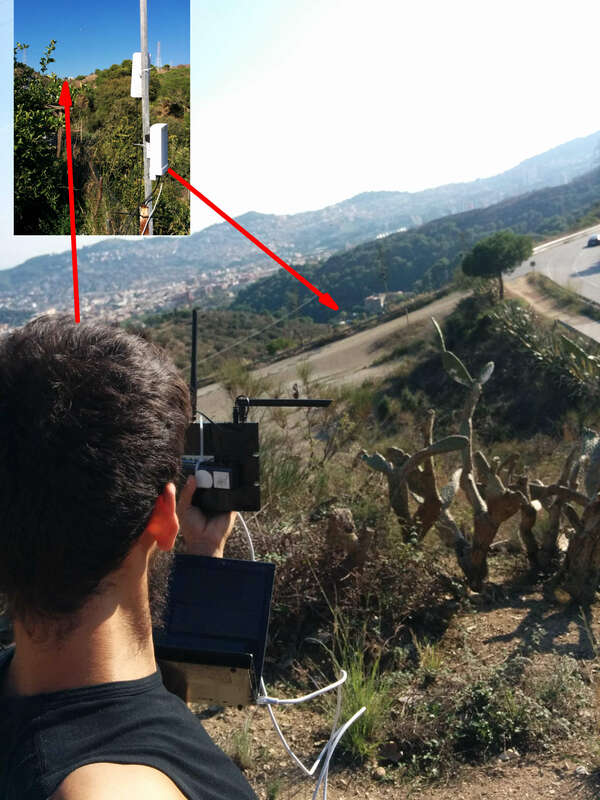 We did the first medium-distance test (500 mts) using the HPM5G: the 5Ghz high power radio that the LibreRouter will use, developed by Dragino. While we were waiting for the LibreRouter mainboard to be ready, we used instead a Mikrotik RB953GS board to host the miniPCIe modules. The SoC is the same as the LibreRouter (AR9558), and while it is a very expensive piece of hardware, it was adequate for early prototyping. For running LibreMesh (LEDE/OpenWrt) on that board, some initial support was done by the team back in January, and this was used during the tests. The antenna is also one of the candidate antennas to ship with the LibreRouter. It’s a MIMO 5ghz panel antenna, that worked pretty much as expected. The remote node (up in the mountain) was a TPLink Archer C7 AC1750, also running LibreMesh, with its original antennas. Using the antenna orientation, I confirmed that the LibreRouter antenna (and radio chains) works as expected: With all the TPLink antennas in vertical position, the LibreRouter radio would receive -75 dBm in chain 1 and -85 dBm in chain 2, while putting all TPLink antennas in horizontal position would yield -87 dBm in the first chain, and -75dBm in the second. With two vertical antennas and one horizontal antenna (as pictured), i’d get a balanced -75 dBm on both chains of the LibreRouter radio. With that final setup (balanced chains on -75 dBm), the TPLink would report the LibreRouter signal to be received at -42 dBm. The difference of received signals is huge, but some factors to consider: different drivers (ath10k vs ath9k), different TX power (23dB TPLink vs 27dB HPM5G), different antennas (3dBi omni vs 12dBi panel). I ran some netperf TCP throughput tests: the LibreRouter radio could transmit sustained ~120Mbps (+/-5Mbps) over 5 minutes without issues, which is great news! Distance was 550mts, with clear line-of-sight. The max TCP throughput observed with the HPM5G is around ~150Mbps, both received or transmitted, to a client a few meters away, with optimal MCS15 rate. which shows an almost perfect correlation, and supports the notion that the radio is actually outputting 27 dB of power at its highest capacity, which is also outstanding.